Brigit Sullivan is a Lati Yellow, a resin ball-jointed doll made by the Korean company Latidoll. She was purchased directly from Latidoll.com in Spring 2008. (Lati only opens for orders quarterly. When they’re not accepting orders, dolls appear as “soldout.” Keep checking back.) She has the “renewal” size body, which is 16cm (~6 1/4″) tall, Lami head mold, and normal skin tone resin. When I got her, I believe she came with both hook and magnet hands and feet. I think right now I have her with magnet hands (easily removable for changing clothes) and hook feet (feet are held on by S-hooks at the end of her elastic stringing. I find it easy to lose magnet feet accidentally). In the first photo, she has a new wig. Monique “Dimples” size 5/6. I think the color is light blonde. In other photos she’s wearing Monique “Lexy” size 5/6, in golden strawberry. Her eyes are 14mm acrylics from Junkyspot in Pale Blue. Faceup by me. Brigit is the fourth of the six Sullivan sisters. I think Ciara and Dana would agree with me when I say she’s the most mischievous of the family. But it’s just because she’s high-spirited and very curious. 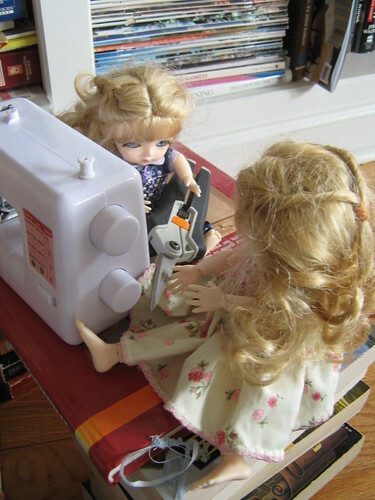 Here she is playing with scissors. 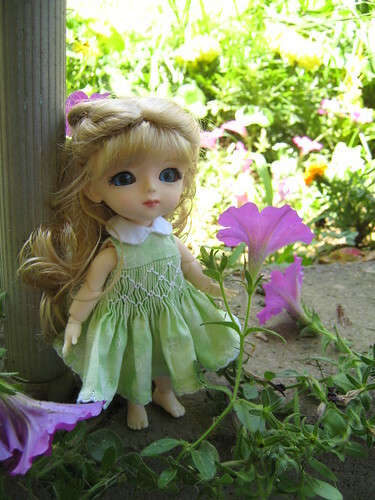 This entry was posted in Collecting, Doll Profiles and tagged 6 inch, abjd, ball-jointed dolls, bjd, dolls, lami, lati yellow, latidoll, tinies. Bookmark the permalink.